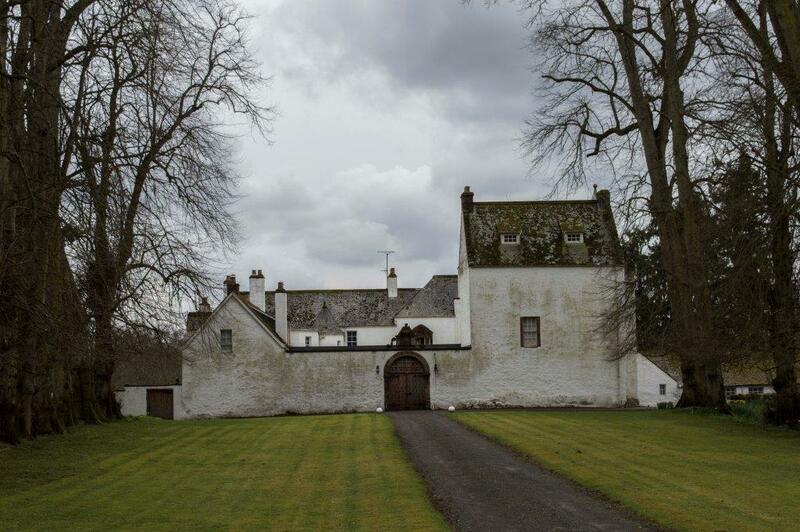 Ardblair Castle is a privately occupied tower house and courtyard a short distance to the west of the town of Blairgowrie. The area around the castle is a shallow bowl-like valley which drains to the west into the Loch of Drumellie; historically it was a shallow loch. The castle itself is built upon a low lying spit of land projecting into the marsh, and was therefore strongly defended, but was most likely not the first defended site at Ardblair. About 200 metres to the east is a site described as an earthwork which consists of an oval-shaped bank around the summit of a low knoll, with partial; remains of a ditch outside it. To the south and west are further terraces which might be interpreted as the remains of defensive banks. Although undated, this could be the site of an earlier castle site or defended manor. The oldest part of the castle is considered to be an L-plan tower in the north-west corner of the courtyard. Unusually, though, the two blocks of the tower are roughly the same size rather than consisting of a main hall block and smaller wing. The two buildings are offset, and a corbelled out round stair turret provides access to the upper floors. These towers consist of a basement, first and second floor, and an attic level. There is a massive chimney stack in one of the courtyard-facing walls in addition to chimney stacks in three of the gable ends, and facing the courtyard the windows have been enlarged. Outward facing windows are smaller, and there is a shot-hole in the external angle beneath the stair turret. Further ranges of buildings line all the walls of the courtyard; these are of varying dates and have been altered several times. The courtyard gate is a large archway with a decorative heraldic panel rising above this wallhead bearing the date 1688, and the doorway to the tower house is similarly ornate, with a large decorative niche above the door itself. Although unoccupied, the unicorn finial may suggest that the royal arms were housed here. The door leads directly to a staircase to the first floor, indicating that although the footprint may be unusual, the layout of the tower house may have followed a more usual pattern. The lands of Ardblair were held by Thomas Blair of the Blair of Balthayock family in the reign of David II. Balthayock (east of Perth) has a large rectangular tower house of this period, and it is certain that the castle at Ardblair postdates this by some considerable time. The estate remained with the family for some 400 years, so the castle is definitely the work of the Blair family, but the exact date of construction is not clear. A date of the late 16th century has been mooted on the basis of the L-plan; the castle does not appear on Pont’s map of Strathardle, Glenshee and Ericht, but does on the map for Garry, Tummel and Upper Tay. Pont’s maps are dated to c1590, supporting the late 16th century hypothesis, although interestingly the castle is shown as a tower with a lower building to the right, and no courtyard. This indicates that the block with the large chimney was heightened after this date, perhaps coincidental with the building of the courtyard wall. During the mid 16th century the Blairs were involved in feuds with other local Perthshire families, including the Drummonds (Patrick Blair being executed for his part in the murder of George Drummond) and in 1562 being required to find sureties for the murder of Alexander Raa of Perth and “diverse other crimes”. No record of any destruction at Ardblair survives, so it appears that the castle avoided being caught up in the Covenanting wars, or the events of the Jacobite period – although the castle is said to house many Jacobite relics. Ardblair passed to the Oliphants in 1792 after this period, and remains occupied today. It is not open to the public.